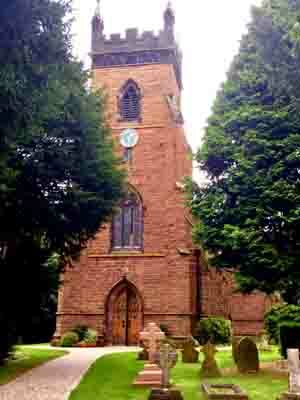 A very attractive Victorian Gothic Revival church, set in lightly wooded grounds where burials still take place. Begun in 1844 and consecrated three years later, it was built of red sandstone. The north and south transepts were added in 1887. Further renovations and additions were done at the close of the 19th and beginning of the 20th century. It is part of a united benefice. They have a Wednesday afternoon playtime for preschoolers. The church hall is available for hire. They have either holy communion or celebration praise each Sunday, with an additional early morning and late afternoon communion service every second or third Sunday. Evensong is held each Sunday evening. Lichfield is in Staffordshire, about 16 miles north of Birmingham. Samuel Johnson, whom the Oxford Dictionary of National Biography calls "arguably the most distinguished man of letters in English history," was born here. The three-spired Lichfield Cathedral dates from the late 12th/early 13th century. Lichfield has the feel of a country village, with many parks, gardens and open spaces; the church was built in the corner of the park surrounding Beacon House. The Revd Janet Waterfield, vicar, was celebrant and preacher. Half full, evenly distributed throughout the church. A warm welcome from a gaggle at the door. Later, someone came to my pew to invite me to after-service coffee. Yes, I believe I was sitting on a long cushion. As seems standard these days, several pairs chatting, while others appeared to be trying to achieve contemplative silence. All fell quiet at the appearance of the celebrant. "Good morning, everyone, and a very warm welcome to our worship today." A booklet printed for the parish, with melodies pasted in, and inserts for the day and the month. Organ and piano, played in masterly fashion. I couldn't help a moment's entertainment when the celebrant dropped her notes while praying for perseverance in those seeking guidance. Slightly trembling upper lip. Only one congregant crossed himself during the general blessing. 7 – I would like to have heard a little more of the vicar's own thoughts as well as the modern parable quoted from the Church Times. There is something of ambiguity about the Transfiguration, as there is with many of the parables of Jesus. Consequently, our respective responses to them are marked by individuality. But there is added value when we arrive at something through our own efforts. The happy warbling of an unseen baby during the gospel reading, referred to humorously by the preacher in the opening to her sermon. Just you try going undercover in a place like this, where people introduce themselves and ask you about yourself! I achieved the ultimate failure by giving the vicar my e-mail address. I was told exactly how to find the parish hall, where it was the local Quakers' turn to serve refreshments. Nice cup of tea in the obligatory green cup and saucer. Someone kindly handed round plates of biscuits. 7 – Friendly but perhaps a little on the overbearing side. Inspiring worship, though. For unknown reasons, I was close to tears, in a good way, at various points in the service  possibly the numinous element I slightly missed in their sermon.